A welcome board is a board displayed at the entrance to a wedding venue. 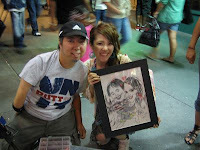 At first, we had no idea, but while in NY (this summer), without expectation, we looked for a street artist in Times Square who can draw something for us. After looking for a while, we found a Chinese guy who drew something we want!!! His drawing was worth the money - using colors cost 25 bucks. 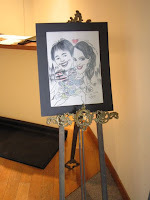 However, lastly, he suggested us to get a frame which cost us an additional 20 bucks! Is he a rip-off?! We thought for a while but we decided to get it because he was a nice guy. Also, we thought we need some kind of frame later anyway. But he was right! The tool he used was charcoal so the drawing can smudge easily!!! I once tried to take it out from the frame but it smudged, so I realized it. I see some people who roll up their drawings, but I don't think they can take home as is.